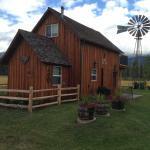 Honey's Place is a holiday home in Kalispell with access to barbecue facilities and a garden. This holiday home also has free WiFi. The holiday home includes 1 bedroom and a kitchen with a dishwasher and an oven. A flat-screen TV is provided. In the wellness area you will find a hot tub. If you would like to discover the area fishing and canoeing are possible in the surroundings. Whitefish is 26 km from the holiday home. Glacier Park International Airport is 14 km away.